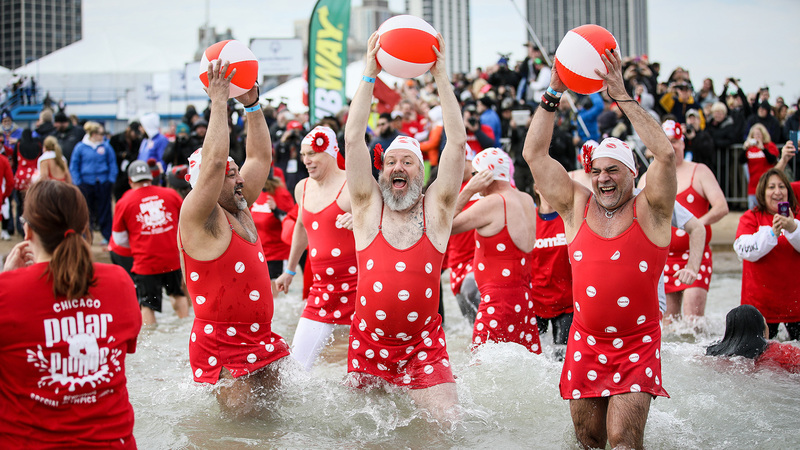 Thousands brave the frigid waters of Lake Michigan at the Chicago Polar Plunge. Will you be one of them? The annual event benefits the Special Olympics of Chicago and all participating plungers will receive a souvenir T-shirt and warm towel upon exiting the water, as well as photo downloads and free food at the annual “melt down party.” Register as a team or an individual ($200 minimum to participate; $100 for high school students). Costumes encouraged. Social documentaries, horror flicks, comedies and whimsical films are among the genres shown at the Chicago Feminist Film Festival. The fest offers nearly 50 independent films, predominately shorts, that seek to address issues of gender, sexuality, race and other forms of inequality that tend to be missing from mainstream media. Dr. Seuss fans young and old are invited to a Green Eggs and Ham Breakfast to celebrate the whimsical author’s birthday and Read Across America Day. The Cat in the Hat will make a special appearance as you dine. Read Dr. Seuss classics and participate in activities post-breakfast. Lively music, elaborate costumes and games highlight Global Connections: International Carnivale Celebration. Discover how different countries and cities across the globe observe Carnivale, or the days leading up to Lent, including Brazil, Italy, Trinidad and Tobago, and New Orleans. Enjoy performances by a half-dozen artists, including the Four Star Brass Band and the Planeta Azul and Passisitas Dancers. Shopping carts are transformed into sleds at CHIditarod. Similar to the Alaskan Iditarod (no affiliation), the annual event features a sled pulled by mammals. Instead of dogs, four costumed humans do the pulling while one mushes them along the roughly 4-5 mile route. Registration for the event is closed, but you can cheer on the teams as they wind through the West Town, Wicker Park and Ukrainian Village neighborhoods. Baked goods are on the menu at Paczki vs. King Cake: Battle of the Mardi Gras Pastries. Though they originate from different areas of the country, their similarities go beyond ingredients – fried dough, sweet and creamy fillings. Dig into the history of these decadent pastries and enjoy freshly baked paczki. (Drool.) Bonus: Leave with a full stomach, recipes, festive beads and a tiny baby doll for your own homemade king cake. Reptiles and amphibians are the focus of Cold-Blooded Weekends. The hands-on, immersive experience is presented with the Chicago Herpetological Society. The 10-day One Earth Film Festival kicks off this weekend with 28 environmental films covering climate change, conservation, food waste, energy and more. Screenings will take place at more than 60 locations in the city and suburbs. Details: Friday through March 10. Screening times and locations vary. $8 suggested donation per screening suggested. Six-time Grammy Award-winners The Chieftains, along with Paddy Moloney, who led the Irish folk group for nearly six decades, start the St. Patrick’s Day celebrations early. The 90-minute concert features modern renditions of traditional Irish folk music and original songs. Five chefs face off at Cochon555, creating dishes from 1,500 pounds of heritage pigs. The friendly competition seeks to raise awareness about heritage breed pigs, some of which are on the critical watch list, by serving up dishes made from the whole pig – think from snout to tail. Craft cocktails and wines are also on the menu.